RE: APPROVED CONTRACT PAYMENT OF US$32,500,000.00 IN YOUR FAVOUR. that you receive your Contract/Lottery and Next of Kin sum from the AFRICAN DEVELOPMENT BANK GROUP in this Last FQuarter of year 2018 fiscal period. Group in respect of Dr.Donald Lukas The Director of International Remittance Department. MEMORANDUM OF UNDERSTANDING of your fund. in this respect, in your own interest (Be Warned). designated bank account and Congratulations. YOU ARE ADVISED TO RE-CONFIRM YOUR INFORMATION TO AVOID TRANSFER OF THIS FUND INTO A WRONG ACCOUNT. come and invest in any part of the World's economy as soon as your fund is paid to you. United Nations Department of Debt Reconciliation and Payment. WINNNING/CONTRACT/INHERITANCE FUND with the African Development Bank Group Nigeria as the nominated accredited paying bank by the United Nation Organisation. to you that you will only pay the sum of US$75.00(Seventy Five United States Dollars only) for the delivery fee of the atm card to you. 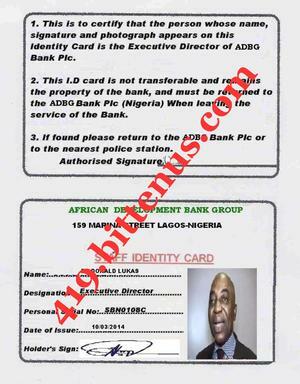 DEPARTMENT OF THE BANK IN RESPECT OF DR.DONALD LUKAS and demand to speak to him on his direct telephone number +234-805-766-6733 forward your details to him immediately. and speak with him for confirmation. After sent the money, kindly fill the below details for pick up and upon pick,your atm card deliver to you. Note that your case can not be attended to if you fail to send the details along with the required money via western union or MoneyGram. RE:PAYMENT INSTRUCTION IN YOUR FAVOR. Thanks for your mail and details well noted. We acknowledged your mail sent for the release of your Inheritance Fund into your designated bank account without any delay.The fund valued US$32.5M was mapped out as an Inheritance fund to you as the rightful receiving beneficiary of the fund. The said fund was over inflated invoice from the Contractors whom sincerely executed a contract with Nigeria National Petroleum Corporation and your name was among the Sub-Contractor whom are to be benefit from this fund.So,the fund now is Inherited to you as an Inheritance Fund which is due to you. The fund will be release to your bank account within 24hrs subject to your co-operation and the transfer of the fund will will commence from ADBG BANK GROUP to your nominated bank account without any delay. 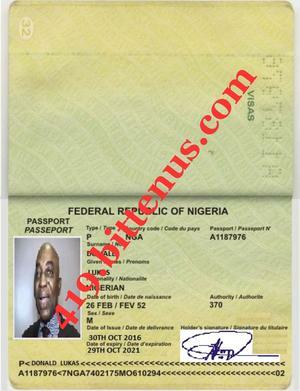 NOTE: I ATTACHED BELOW FOR YOUR PERUSAL MY ID CARD,PASSPORT COPY TO ENABLE YOU KNOW WHOM YOU ARE DEALING WITH. CAREFULLY SEE YOUR ATTACHMENT FILE AND VIEW THE DOCUMENTS AND ACT ACCORDINGLY. Upon the receipt of the above from you, we will furnish you with the details of your payment. Looking forward to hear your urgent reply in receipt of this mail. for: African Development Bank Group.